The Director is IN. 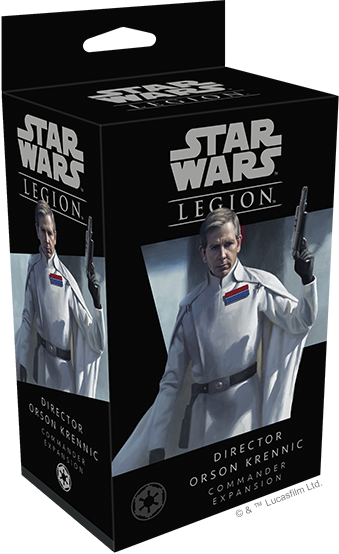 Check out the next Commander for the Empire – Director Orson Krennic! Ambition is a powerful thing and sometimes it can cause folks to bite off more than they can chew. But that hasn’t caused Director Krennic to stumble…yet. 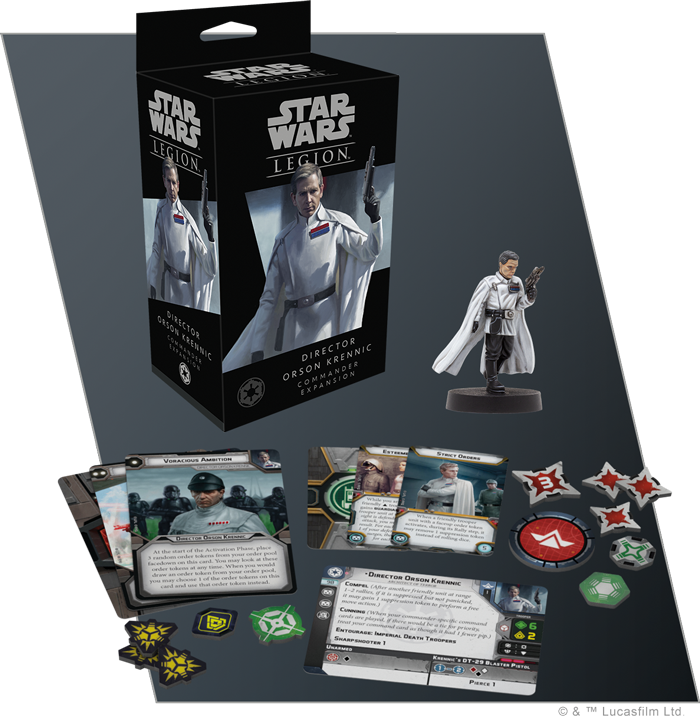 Today, Fantasy Flight Games pulls the covers off the new Commander Expansion. 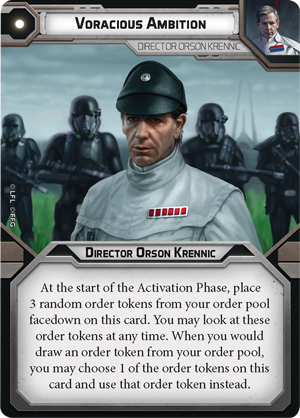 In Rogue One, Director Krennic came across as more of a ruthless project manager who just wanted to be in charge. He was also willing to get his hands dirty (provided he had the support of his Death Troopers). His rules reflect that mix of bureaucrat and over-confident battlefield commander. Krennic isn’t a slouch in combat with this custom DT-29 blaster pistol. Just try to keep him out of melee as that’s not exactly his area of expertise. He does have an air of confiedence which is probably why he’s got Compel as rule. Plus he’s smart so Cunning also fits. However, he does keep his Entourage of Imperial Death Troopers around, so that could be why he feels so sure of himself. 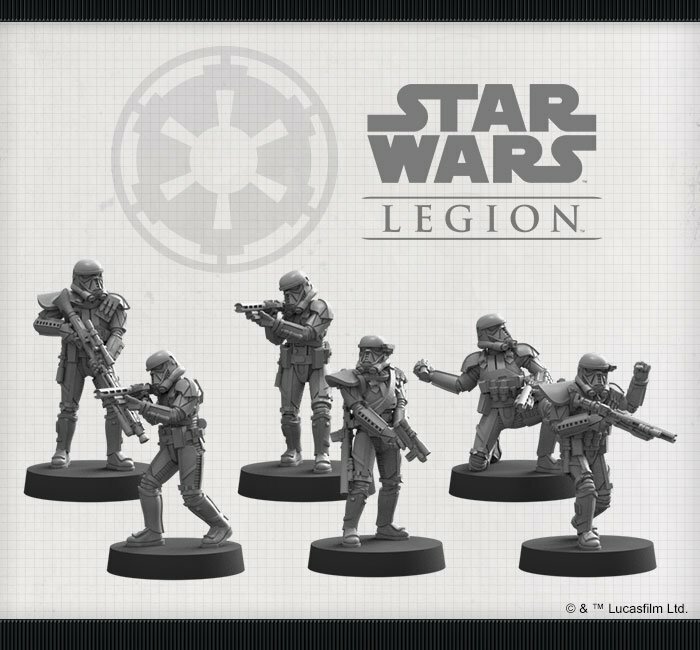 That Entourage allows you ignore a rank of Death Troopers when constructing your army – basically you get a free unit! Death Troopers – Don’t Leave Home Without Them! Voracious Ambition adds a little luck and a little bit of “poker-face” to the equation. You’ll get 3 random orders that you can pull over to this card and use instead of the order tokens you’d normally draw. Because you’ll know what they are a head of time, you can make your opponent second guess themselves with their plays. Krennic loves those head games! 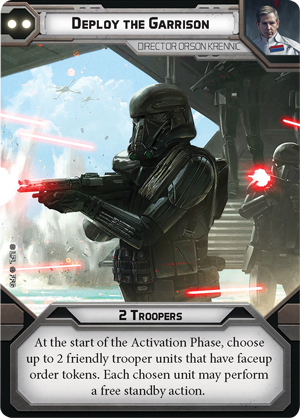 Deploy the Garrison allows you to get some free standby actions for your Troopers. That’s a great way to up your action economy. And finally Annihilation Looms is the “big” order. 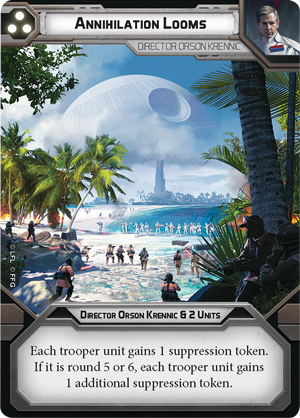 This card drops suppression tokens on each trooper unit. And if it’s round 5 or 6, they each get TWO. That’s going to cause some major problems for units that were already feeling skiddish! Good thing your Death Troopers can ignore the first one, right?